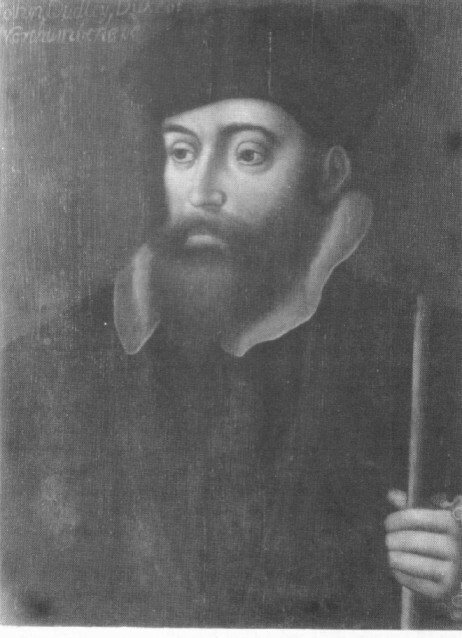 John Dudley, 1st Duke of Northumberland. Painted some time after his death, 1605–1608. 1st Earl of Warwick, 1st Viscount Lisle. 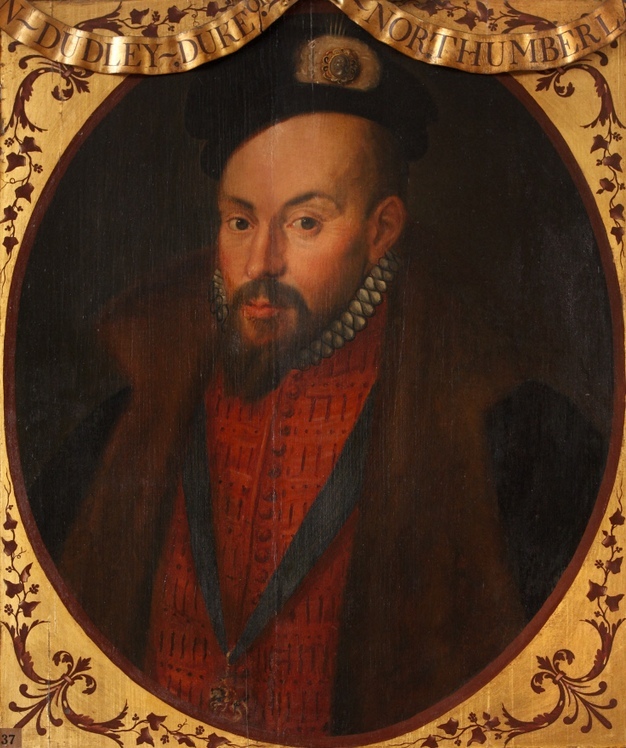 He mar 1525 to Jane Guildford [born 1509, dau of Sir Edward Guildford]. He was cr Viscount Lisle 1543. Lord High Admiral (head of the Royal Navy) 1543-47. He re-organised the English navy. He became one of the Protestant leaders at the court of Henry VIII. Henry VIII died January 1547. Dudley and Edward Seymour became the leaders of the regency of the boy king Edward VI (reigned 1547-53). He was cr Earl of Warwick 1547. He defeated Kett's Rebellion Aug 1549. He overthrew Edward Seymour in Oct 1549. He became Lord President of the Council Feb 1550. He effectively ruled England 1550-53. He was cr Duke of Northumberland 1551. Chancellor of the University of Cambridge 1552-53. As Edward VI was dying with no heir, Dudley planned to make his daughter-in-law, the teenage Lady Jane Grey, Queen of England, and hence to effectively rule himself. Edward VI named her as his successor in June 1553. 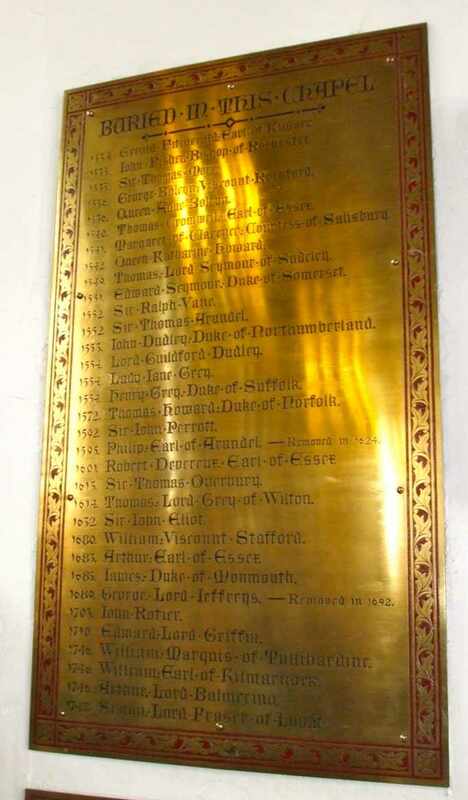 Edward VI died 6 July 1553. Jane was Queen for 9 days in July 1553, but was rapidly deposed by Mary. After Lady Jane's fall, Dudley tried to escape execution by renouncing Protestantism, saying "A living dog is better than a dead lion". This earned widespread contempt. Lady Jane said: "I pray God I, nor no friend of mine die so". bur in the Chapel Royal of St. Peter ad Vincula in the Tower of London, no monument. Jane Guildford died 1555, age 46 yrs. 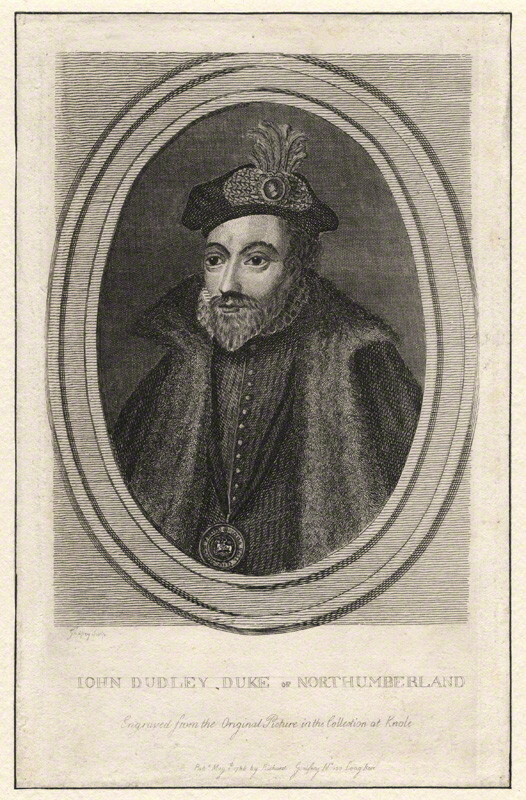 mar Sir Henry Sidney, K.G. and had issue. 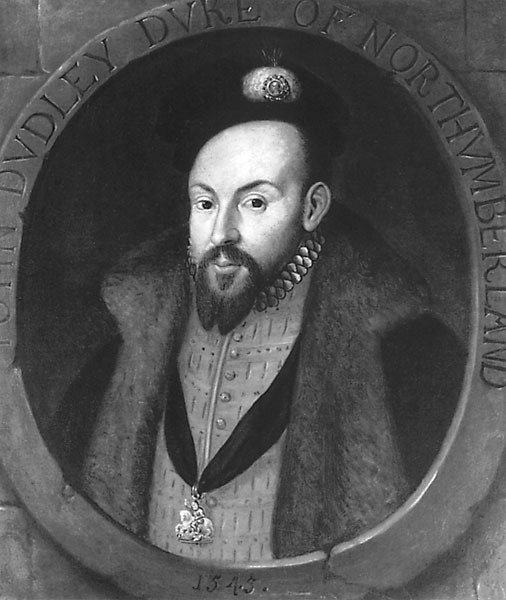 John Dudley, 1st Duke of Northumberland, 1545. 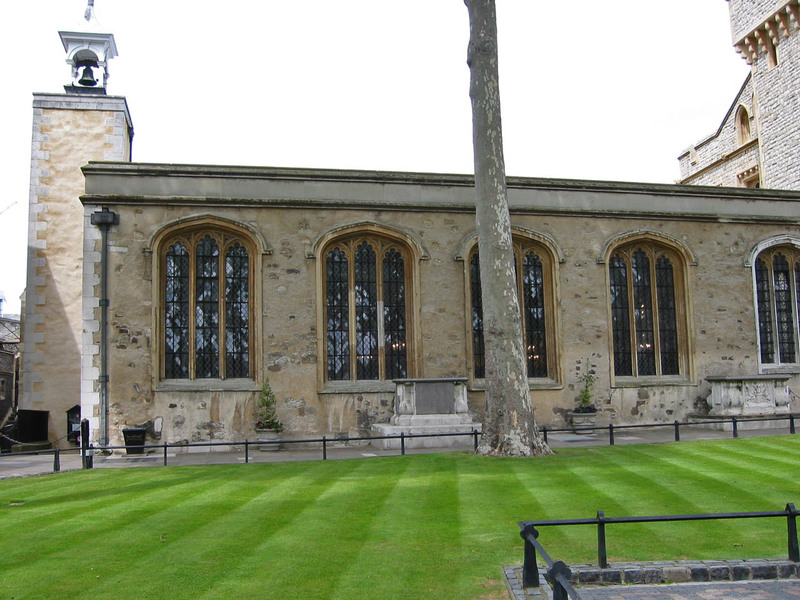 Chapel of St. Peter ad Vincula, Tower of London (burial place of John Dudley, 1st Duke of Northumberland, and others executed there). Search for more photos and Creative Commons photos of chapel. 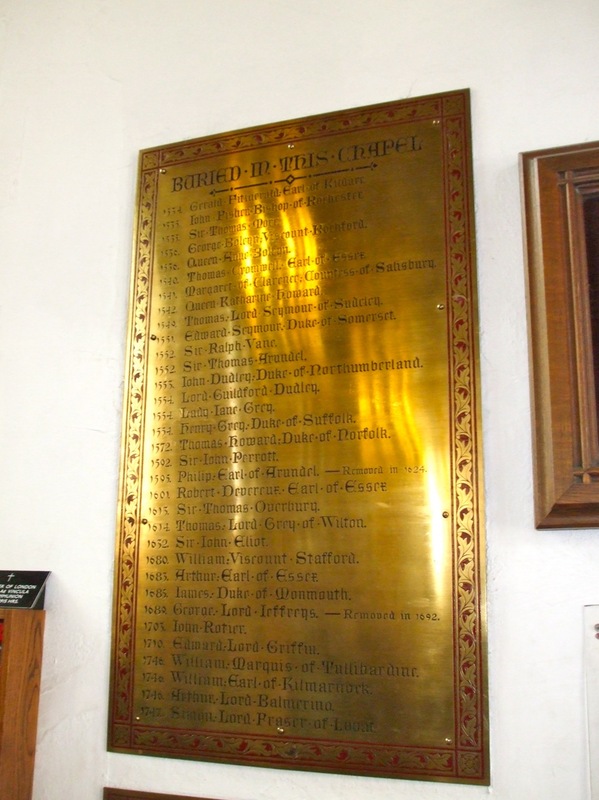 Plaque on wall of Chapel of St. Peter ad Vincula, Tower of London, listing some of those buried there with no monument (after their execution). Image courtesy of The Anne Boleyn Files.